I thought it might be interesting to do a series of posts documenting what my life as a dietetics student is like each day of the week this semester. I want to try and do some posts to document the whole “RD In Training” experience, not only for myself, but for other students who might be looking at the same career path. Since each of my school days has a different schedule, I’m going to break it down day by day. And since today turned out to be what I think will be a pretty typical Monday, why not start there? 6:45 am – Rudely awoken by alarm that you set thinking you might get up and work out before school. Realize that’s never gonna happen, and go back to sleep. 7:45 am – Wake up again, this time actually getting out of bed. Proceed to do the usual morning stuff. 8:00 am – Enter kitchen, proceed to make breakfast. 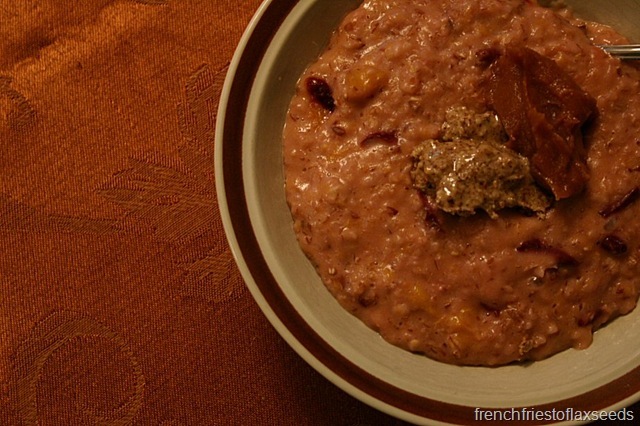 How about a nice bowl of oatmeal? 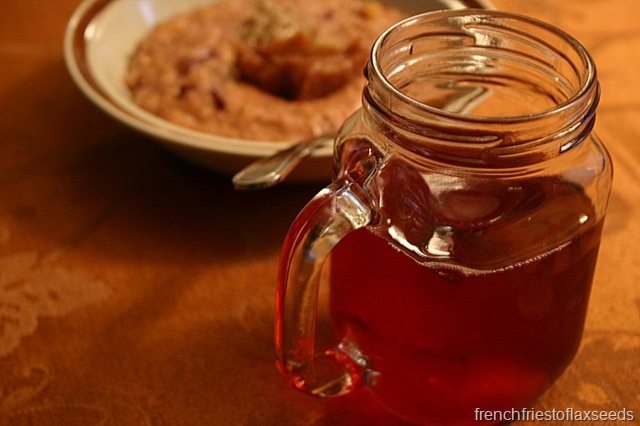 And a glass of cranberry juice for good measure. 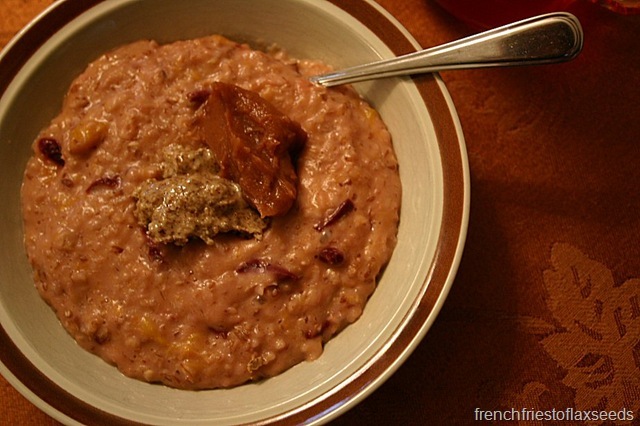 8:16 am – Realize plums cooked in oatmeal are awesome. Rue the fact that you always thought you hated plums. 8:17 – 8:30 am – Waste time on the internet. 8:31 am – Phone Admissions office at school to sort out tuition issues (don’t ask). 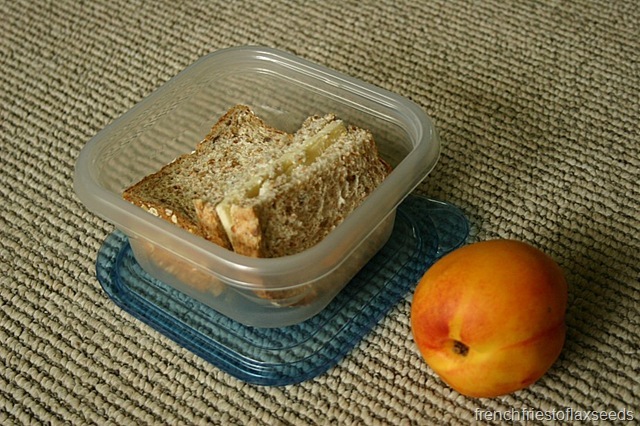 8:40 am – Hang up phone, pack up a lunch. 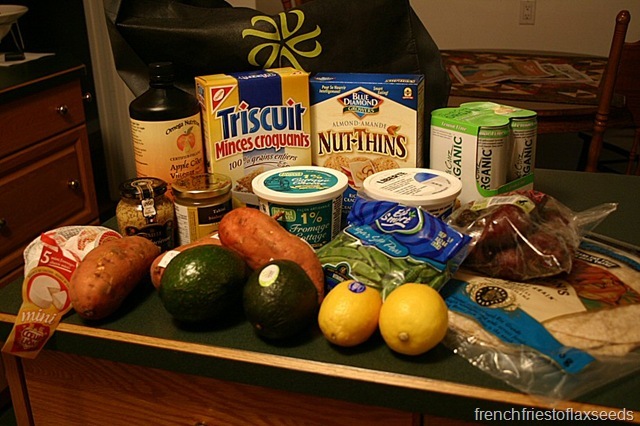 Start out making a salad, decide you don’t want that for lunch, and move on to something else. 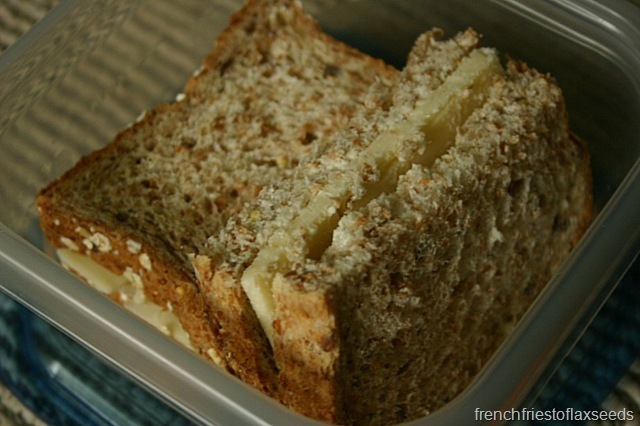 Just you basic cheese sandwich – Silver Hills “The Big 16” Sprouted Grain Bread with aged white cheddar. 8:55 am – Pack bags, get dressed, make self presentable to outside world. 9:15 am – Have your retired parent drive you to the Skytrain station to avoid unnecessary time on the bus. 9:29 am – Arrive at said station. Promptly plug into iPod and ignore world. 9:35 – 9:53 am – On board Skytrain, reading Rolling Stone magazine and monitoring Twitter on your Blackberry. 10:00 am – Board crowded express bus to school. 10:00 – 10:40 am – Bus ride, where you attempt to read more of your magazine, but instead “rest your eyes” for most of the trip. 10:41 – 10:53 am – Wander over to your only class for the day. Wait impatiently for the lecture hall to clear, because you want to actually get a seat in your class of 500 students. 11:00 – 11:50 am – Human physiology lecture. Manage to stay awake the entire class. 12:00 – 12:37 pm – Find yourself back on board the bus. Eat sandwich in transit. 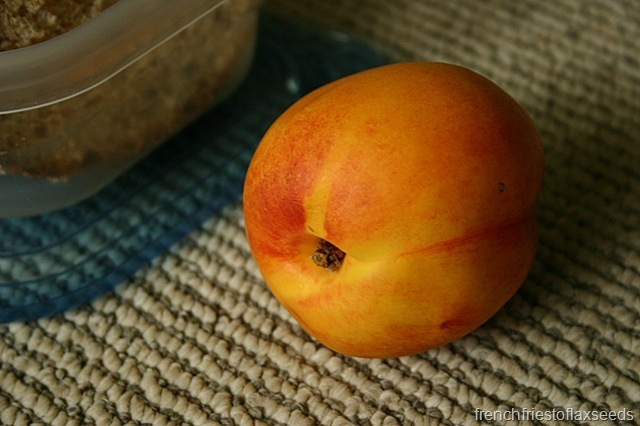 Decide nectarine is too messy for public transit. 12:42 – 1:00 pm – Skytrain ride back to the ‘burbs. 1:01 – 1:20 pm – Dad picks you up, drives you home. Eat nectarine in the car. Apparently it’s not too messy for that. 1:30 – 2:30 pm – Decide you have enough energy for a workout. Get sweaty. Realize you need a shower like it’s going out of style. 2:45 pm – Find yourself in need of a snack. 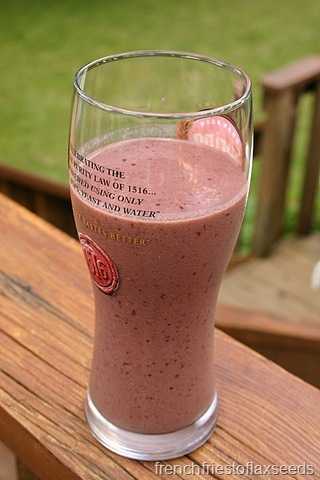 Whiz up a chocolate cherry smoothie. Vega Shake & Go Smoothie Choc-a-Lot with frozen cherries and almond milk. 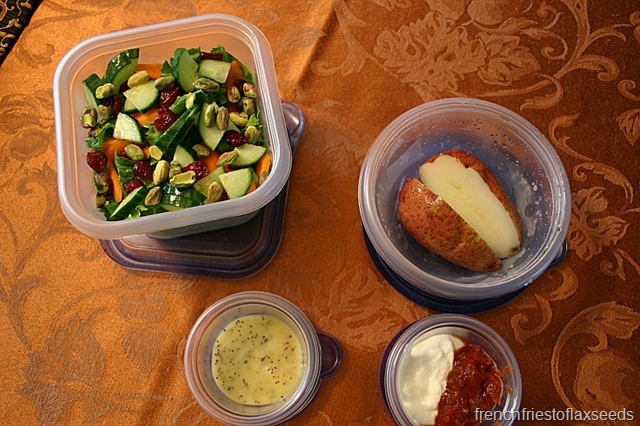 3:31 pm – Create your second packed meal for the day, to be enjoyed at work. 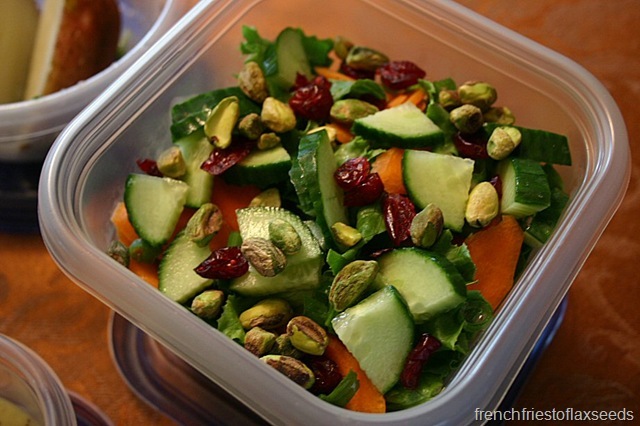 Salad of green leaf lettuce, cucumber, carrot, green onion, dried cranberries, and pistachios. Caramelized onion & poppy seed dressing to accompany. Plus a leftover baked potato, to be dressed up with sour cream and salsa upon eating. 3:37 pm – Get ready for work. Make sure to wear your heinous tie, just because you think it’s amusing. 4:00 pm – Leave for work. 4:01 pm – Realize your keys aren’t in your purse. Scramble around to find them. 4:05 pm – Find keys and actually leave for work. 4:10 pm – Arrive at work. Good thing I only live a few minutes away. 4:15 pm – 6:00 pm – Scan, bag, and ogle people’s groceries. All with a smile of course! 6:00 pm – 6:20 pm – Power eat dinner while checking 15 text messages from your cousin. Seriously?! 6:21 pm – 8:15 pm – More of that work crap. 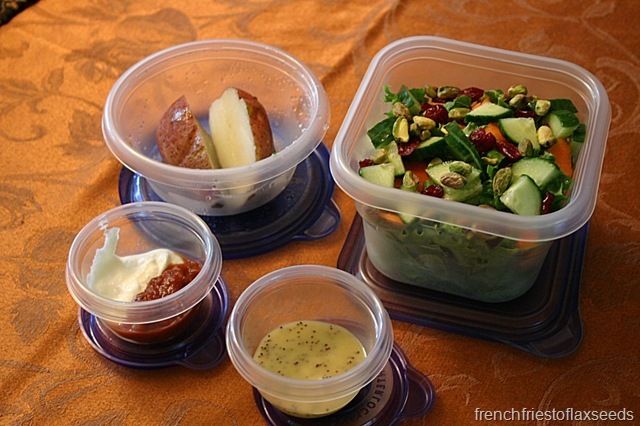 8:16 pm – 8:40 pm – Do a much needed grocery shop to stock up on essentials for your packed lunches and other meal creating occasions. 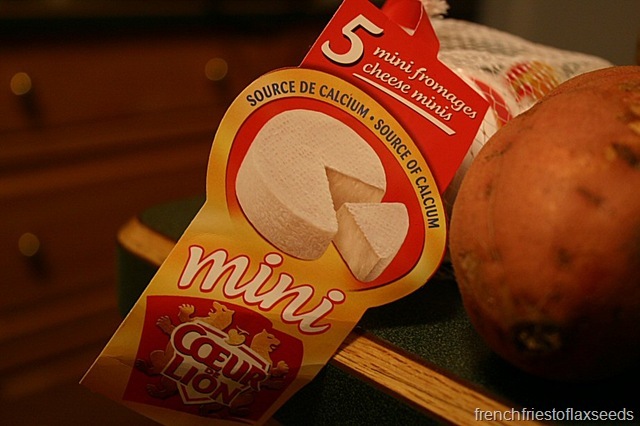 Including fun things like individual sized camembert cheeses. Seriously, how could I not buy these? And some beets. 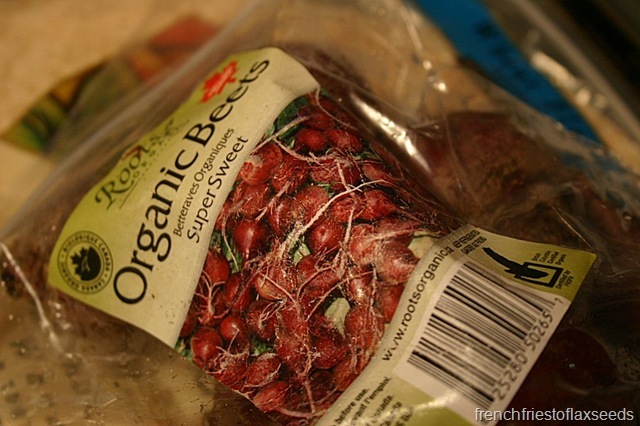 I think I don’t like beets, but I’d like to change that. 8:55 pm – Arrive back home. Promptly change out of shirt, tie, and dress pants into pajamas. 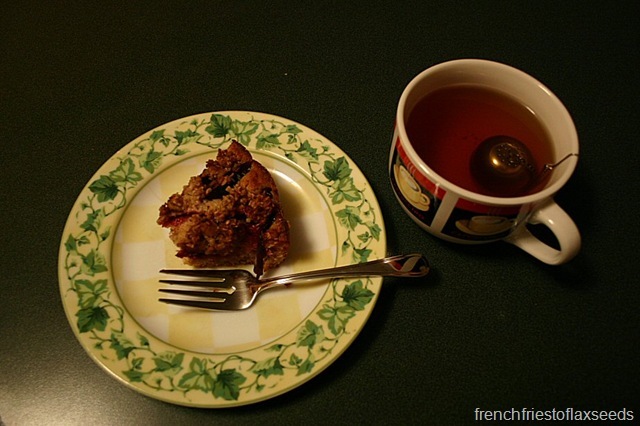 9:00 pm – Evening snack! Mystery baking project and some Silk Road Velvet Potion tea. Mmmm. 9:05 pm – 10:00 pm – Again with the internet. Gotta keep up on things! 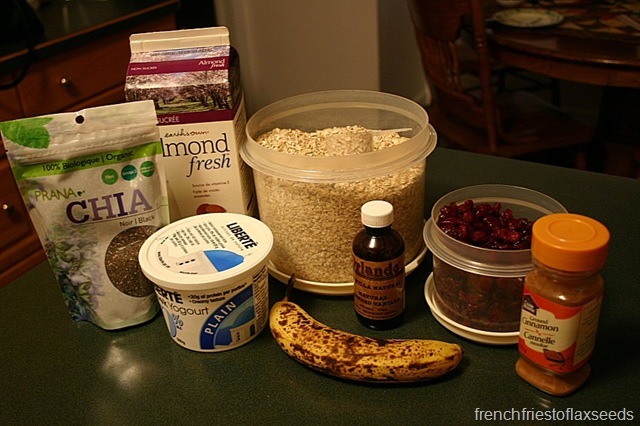 10:01 pm – Decide to make breakfast for the AM. 10:15 pm – 11:24 pm – Blog. And by blog I mean upload pictures, review pictures, edit pictures, then write. I am the slowest blogger ever. Probably because I’m easily distracted by things like cats and email. 11:25 pm – Publish said blog. 11:16 pm – Get some school reading done. And probably read other people’s blogs. I’m just being honest. 12:00 am – Bed time…I hope! 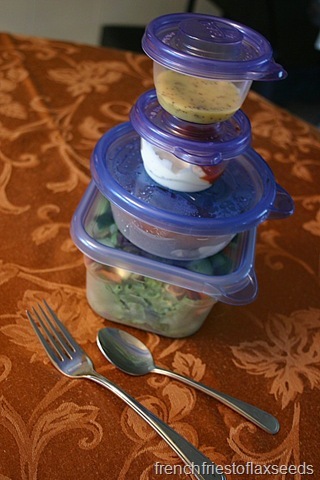 And that, my friends, is A Day In The Life Of A UBC Year 3 Dietetics Student – Monday Edition. I think I need to come up with a shorter title. I thought my day was exhausting. Geesh! i love your mugs–i got my sister the exact same ones for christmas last year because she loves drinking out of jars but also needs a handle. Sounds like a busy day, indeed! Love the addition of pistachios to your salad. Holy cow your day sounds busy. I know what you mean about waking up to work out and just going back to sleep. I did that this morning.